Directions: Click on the titles of your choice to view them. Question: What do you believe are the importance and potential impacts of our meetings with The White House today? 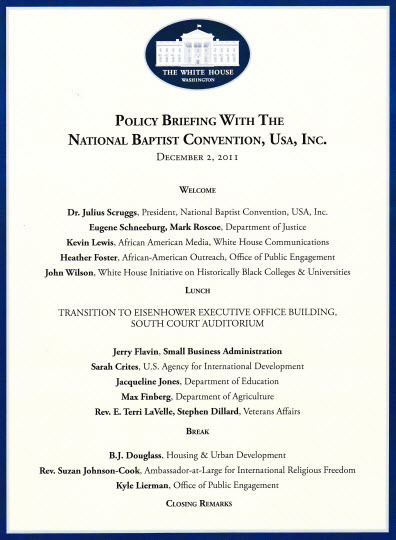 Reverend Alvin Love, Dr. Marcus Cosby, Dr. Willie Gable, Dr. Gilbert Pickett, Sr., Dr. Frederick Haynes, Dr. Ronald Grant and Dr. Forrest E. Harris, Sr.
Reverend Alvin Love discusses the importance and impact of the December 2, 2011 meetings at The White House. Dr. Marcus Cosby discusses the importance and impact of the December 2, 2011 meetings at The White House. Dr. Willie Gable discusses the importance and impact of the December 2, 2011 meetings at The White House. Dr. Gilbert Pickett discusses the importance and impact of the December 2, 2011 meetings at The White House. Dr. Frederick Haynes discusses the importance and impact of the December 2, 2011 meetings at The White House. Dr. Ronald Grant discusses the importance and impact of the December 2, 2011 meetings at The White House. Dr. Forrest Harris discusses the importance and impact of the December 2, 2011 meetings at The White House.